It would be appropriate to analyse the whole affair with a cool mind, since a lot has already been written and spoken about the exploits of the ex-CIA contractor and his quest for a safe haven. So, the fugitive US ex-CIA/NSA contractor has got papers for temporary asylum in Russia. Before his lawyer Anatoly Kucherena showed the photocopy of the asylum certificate to reporters on August 1, the world's 'most wanted person' left the transit zone of the Sheremetyevo International Airport, took a cab and went to an undisclosed 'safe location' for obvious security reasons. The papers issued to Snowden are valid for one year and allow him to stay and freely travel around Russia. The suspense is over and there is an intermission in the saga of the American fugitive. It would be appropriate to analyse the whole affair with a cool mind, since a lot has already been written and spoken about the exploits of the ex-NSA contractor and his quest for a safe haven to avoid the US judiciary. In the Cold War-era, the saga would have developed in a dramatic way, Snowden spilling more beans in the Moscow limelight and later disappearing, just to reappear in Havana after sometime, where he would have been ferried on board a Soviet long-range bomber or a nuclear submarine. But times have changed. Neither President Putin nor any senior intelligence boss looked impressed at the facts leaked by Snowden, which probably were known to them through their own moles in Washington. Quoting intelligence sources, Moscow's 'Bizness FM' radio dubbed Snowden 'a waste material'. Under Putin, Russia is believed to have revived and upgraded its electronic surveillance and counter-espionage system run by FAPSI – the Russian acronym for Federal Agency for Government Communications and Information - to safeguard electronic communications of the top leadership and keeping a close watch on the US and allies. Initially, Snowden was China's headache, which looks after Hong Kong's foreign and defence policies. In order to avoid a showdown with the US, Beijing subtly let him board a Moscow-bound plane in Hong Kong for an onward journey to Havana, ultimately leaving the fugitive whistleblower trapped for almost six weeks in the transit lounge of the Moscow airport. As Uncle Sam is fretting and fuming, signalling that Obama could the September summit in Moscow, calls are also being made to skip Sochi Winter Olympics next year to punish Russia, President Putin, himself a former KGB agent in East Germany, summing up the Snowden episode said : “International relations, in my opinion, are more important than the squabbles over the activities of secret services”. Revelations made by Snowden about global snooping by NSA under its various surveillance programmes like PRISM and Boundless Informer could be a shock for blind believers of 20th century concept of 'privacy of correspondence'. However, eavesdropping on foreigners, opponents or 'untrustworthy' countrymen has been a 'dharma' of every self-respecting state and in this matter India, Russia or US are no exception. Albeit, depending on their technological potential, these capabilities might vary and are least related to the level of democracy in the country. 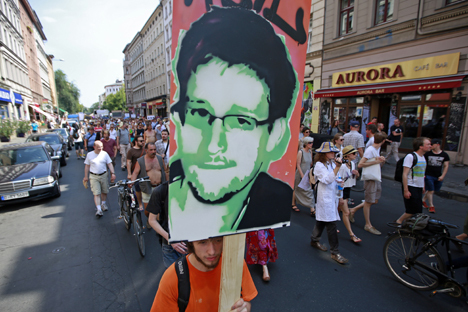 There are other aspects of the Snowden affair, which need to be focused on. First of all, post-9/11 the global anti-terror combat has led to the convergence of secret services and formation of a sort of Intelligence International, they are becoming an independent player on both sides of the Atlantic. Brutal American pressure on nations willing to grant asylum to Snowden, denial of overflight facilities to Bolivian President Evo Morales' plane by several NATO countries (prompted obviously by CIA's Snowden stowaway suspicion) and ultimate grounding of the presidential aircraft in Vienna for search, smack of the Brezhnev-era concept of 'limited sovereignty' for the Moscow's Warsaw Pact allies. Another inference drawn from the Snowden leaks is that we all are under watchful eye of Uncle Sam. The volume of metadata collected by NSA probably, I would rather say, most likely, contains e-mail and mobile phone records of today's influential politicians and bureaucrats across the globe from India to Germany and France, making them vulnerable to blackmail, if their activities are deemed against American national interests. This explains the overtly harsh, but substantially meek official reaction abroad on the American NSA's snooping on various embassies and other diplomatic missions on its soil, including the Indian embassy in Washington and missions of America’s closest EU allies. Probably, the Americans have well mastered the Russian saying 'Doveryai no proveryai' (Trust, but keep on checking), since it was quoted by former US President Ronald Reagan in 1989 (during the Moscow visit) while speaking from the heart of the 'Evil Empire'. Snooping on diplomatic missions and foreigners visiting the country might be a common practice by the secret services. However the US spying agencies collecting huge information about the e-mail correspondence and phone calls of millions of people living in other countries pose multiple risks to these nations. First of all, this becomes a tool for US manipulation of political processes in countries like India with an alarming level of corruption among the politicians and bureaucrats.